An unusual form of pustulo-ulcerative disease of the skin. Journal : Journal of cutaneous and genito-urinary diseases ; vol. 7. New York : D. Appleton and company, 1889. Description : 401-407 p. ; ill.: 2 phot. ; 26 cm. Photographs : 2 photoengravings in-text (unverified). Subject : Skin — Idiopathic diseases. Author caption: E. B. BRONSON, M. D., Physician to Charity Hospital. Medical degree, New York College of Physicians, 1869. Professor of dermatology, New York Polyclinic, 1882-1904. Read before the American Dermatological Association, Boston, Sept. 19, 1889. Bronson died in a house fire. The first photograph is a close-up of the 14 year-old subject's face, the second is a close-up of his right buttock and forearm. 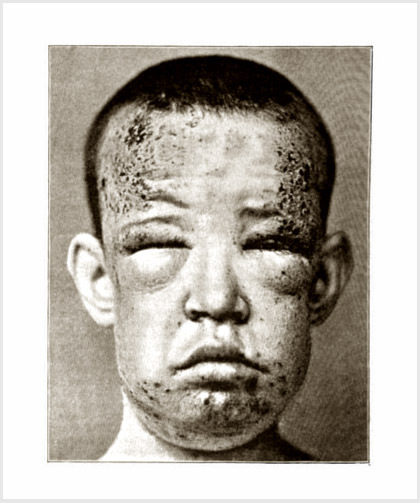 A very interesting case which Bronson finally labeled, acne cachecticorum phlegmonosa et ulcerosa. However, Bronson notes the neuropathic symptoms and writes that the boy worked in a wallpaper factory where he was probably exposed to a combination of toxins including arsenic, lead and cadmium.